What are the domain names? What are second-level domain names, third-level domain names and sub-domain names? How to use our own domain names? What are CN domain names? What advantages to register CN domain names? What categories of CN domain names? What CN-suffixed domain names can be registered? What are the naming rules for CN domain? How to choose the CN domain names to be registered? What are the procedures for CN domain name registration? V.How to register the GOV domains? VI.How to register the protected domain? After .CN domain has been successfully registered, what does the user need to pay attention to? 1. How to transfer registration of CN domain names? 2. How to change CN domain name registrar? 3. How to resolve the domain name dispute? A domain name is similar to a house number on Internet, a hierarchical-structure character identification used to identify and locate the computer and corresponding to the Internet Protocol (IP) address of the computer. But compared with the IP address, it is more convenient for users to understand and memorize. The generic top level domain names (referred to as gTLD) correspond to different types, more frequently, such as, .COM, .NET and .ORG. 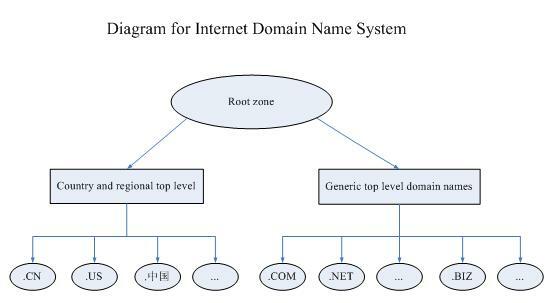 In recent years, ICANN has added some top level domain name types according to the requirements of the domain name system, such as, .BIZ and .INFO. 3. Use in enterprise and product promotion, for example: to display your own or your own entity’s homepage. 4. Domain names can be pointed to your own Weibo or web space. The CN domain names are Chinese top level domain names, featuring the domain names with .CN as the suffix, including the second-level domain names directly registered under .CN and the third-level domain names registered under the .CN second-level domain names. CN is the Country Code Top Level Domain(ccTLD), representing China. China Internet Network Information Center (CNNIC), as the .CN registry, responsible for the operation and administration of .CN domain name system, and maintenance of central database. 5. Significant function of identification can reflect your own values and positioning. 2. Under the CN top level domain names, you can set such two categories of second-level domain names in English as “category domain names” and “administrative region domain names”. The third level domain names registered under “.GOV.CN”shall meet the requirement of Article 2 of Chapter 3 of CNNIC Implementing Rules of Domain Name Registration. For detailed requirement, please see note below:How to register the GOV domains? The rules for the third level domain names registered under “.EDU.CN” are stipulated separately by the China Education and Research Network. The rules for the third level domain names registered under “.MIL.CN” are stipulated separately by China Greatwall Internet. (2)The administrative region domain names refer to those domain names assigned in accordance with abbreviation of each administrative region in China, totally 34, applicable to China's 34 provinces, autonomous regions and municipalities directly under the central government. For example: Beijing's institutions may choose such domain names as online.bj.cn. 3. At most 63 characters can be registered.The maximum length for 中文.CN registration should be calculated after transferred into punycode. The transcoding method refers to "Online Transcoding of Chinese Domain Names". 2.Vocabulary directly marking the registrant, such as, full spelling of an individual's name in English and in Chinese: 姚明.cn,liming.cn, and full spelling of an entity's name in English and in Chinese or abbreviated forms as 中央电视台.cn, sina.com.cn. In order to encourage individual users to pay close attention to the civil rights and interests related to their names, and promote the use of the domain names corresponding to the names by more relevant people, our Center supports such behaviors of the individuals to register the domain names related to their names. The name-related domain names refer to those domain names registered by individuals strongly related to their names, including corresponding English and Chinese pinyin. 5. Such network popular words easy to remember as 520.cn. The CN domain name shall follow the principle of “first application for the first registration”. The CN domain names can be registered for service up to 10 years, you can freely select the registration term within 10 years(with “year” as the unit). You can log in our website (www1.cnnic.cn) and use the “WHOIS lookup” to verify the registration results of the domain name. (2) Contact the “registrant” of this domain name displayed in the WHOIS lookup results to resolve through consultation. For detailed requirement for protected domain registration, please see note below: How to register the protected domain? 3. Select a satisfactory registrar on the accredited registrar list of our Center. The registrar refers to the entity able to approach domain name registration, directly complete registration of domain names in domestic China. CN domain names are subject to the oriented-market price, the registrars will develop a reasonable price based on the market conditions. You can get access for information about domestic and overseas registrars through our website　and Select a satisfactory registrar to handle domain name registration. (5) Domain name registration term. The domain name registration application may be different among registrars.You can confirm the submission way of domain name registration application with your registrar. While handling domain name services, it is recommended that you sign a registration agreement or contract with your registrar online or in written form, and keep the relevant documents, in order to better safeguard your rights and interests. (2)“WHOIS lookup” system on the registrar’s website. (3) The application materials should match the registration data in the “WHOIS lookup” system. Once the domain name online application is submitted,the registrar will make initial verification of the domain name registration information and data. After the domain name has passed through the verification, the registrar will submit the application documents to CNNIC for further verification, CNNIC finishes reviewing the domain name registration information and data in one working days. You can pay close attention to the verification progress and status of your domain name through the registrar. If your domain name has passed through the verification, it indicates that the domain name has been successfully registered. The domain name itself does not need to be recorded. However, if you use the domain name for any website application, your website shall be recorded according to the relevant requirements of the Ministry of Industry and Information Technology of the People’s Republic of China for website management. The website record is not undertaken or approved by our Center. The user should contact the relevant Internet service provider (ISP) or registrar to complete the website record through the provincial communications authorities. Mode 1: Set resolution through the DNS server of the registrar (recommended). (2) Based on the resolution function provided by the registrar, the user can set the CN domain resolution A records /CNAME records /MX records to complete the related CN domain resolution work. Mode 2: Use your own DNS resolution server to set resolution. (2) The user configures the CN DNS server on his own to complete the CN domain related resolution work. Mode 3: Use the national domain cloud DNS platform (www.cdns.cn). (3) Through the registrar, the user can set the DNS server of the CN domain as the DNS resolution server provided by the cloud DNS platform to complete the CN domain related resolution work. Domains above are equivalent and can get access to the same website accordingly. In case of IE 6.0 or lower　browsers, then you need to enter http:// 中文.CN in the address bar, and guided by the page, you can reach the corresponding website, for example: http://www.新华网.cn. V. How to register the GOV domains? The GOV domains under the CN domains namely refer to such domains representing Chinese government agencies as miit.gov.cn. The applicants should be the administrative legal persons or the public institutions implementing the administrative functions as regulated by laws and administrative regulations. (4) When the same applicant is applying for registration of five (inclusive) or more GOV domains, the applicant should offer a list of the organizational users respectively corresponding to such domains with the applicant seal attached. At the same time, our Center will verify the authenticity and effectiveness of the GOV domain registration information. VI. How to register the protected domain? Protected domain names refer to certain words related to interests of the nation and the civil society,CNNIC may take necessary measures to protect them according to China Internet Domain Name Regulations. The registrar will submit the application materials to our Center, and if qualified, our Center will transfer the domain to the database of the registrar. If the application materials are not qualified, our Center will notify the registrar of the reasons. The auditing time will be three working days since our Center receives the relevant materials. VII. Tips after successful registration of the domain. In order to ensure the registrant’s legitimate rights and interests to legally hold the domain and properly implement the Internet applications, you shall pay attention to any change of the domain information after registration to ensure that the domain registration information be authentic, accurate and complete. According to the provisions in CNNIC Implementing Rules of Domain Name Registration, the annual maturity day will be the day for application. The maturity day follows the renewal confirmation day that lasts for 30 days. If you show the intent not to renew in written within the above-mentioned period, your registrar has the right to cancel the domain in 30 days; if you don’t show the intent not to renew the payment in written or you have not renewed the payment, the registrar has the right to cancel the domain on the maturity date of the above-mentioned period. Transfer of registration of domain names refers to changing domain name holder's registration information. According to Chapter 4 Domain Name Changes and Cancellation in CNNIC Implementing Rules of Domain Name Registration, any organization that applies for domain name transfer shall submit the valid and effective application form for domain name transfer and identification. Registrars shall audit when receiving the materials above within three working days and change the domain name holder after the qualified auditing result. You can submit materials required for domain name holder change and identification to your current registrar. After the qualified auditing your will and materials, the registrar will help you transfer registration of domain name.Please confirm the change way and handling procedures with your current registrar. Change CN domain name registrar means transfering your domain name from one registrar to another, that is the change of registrar information. The original registrar (hereinafter referred to as the transferor) shall send the correct transfer code to the management contact email of the domain name registration information within three working days after receiving a valid application submitted by the domain name holder, and shall not charge for the transfer. You can get the transfer code by submitting qualified materials required for registrar changing, and pass the correct transfer code to the transferee to complete registrar changing.For requirements and materials mentioned above, please see note to Chapter 5 Changing of Registrars in CNNIC Implementing Rules of Domain Name Registration. 3.How to resolve the domain name dispute?